Bedford Winery special events coordinator Helen Daniels attends to the display of wild fungi at a previous year's Mushroom Festival at Bedford Winery in Los Alamos. A large selection of mushrooms was available at the 10th annual Mushroom Festival at Bedford Winery in Los Alamos. Uniting local wine lovers and admirers of the delicately capped fungus with a plethora of purpose, is Los Alamos' 13th annual "Mushroom Festival" hosted by Bedford Winery Tasting Room and Courtyard on Saturday, Jan. 26 from 2-5 p.m.
And this year, the entire town of Los Alamos is in on it, making it a mushroom-centric weekend. 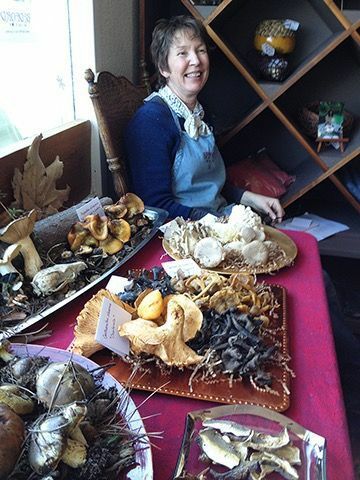 Each year local and cultivated mushrooms are featured at the fun, fungi event, along with those brought in from Oregon. Dried and fresh, there will be a multitude of varieties, including Chanterelles, Hedgehogs, Shitake, Porcini, Oyster, Maitake, Candy Cap, Huitacoche, and Black Trumpet. “After years of drought, the rains of El Niňo are setting the stage for a good mushroom year. Our mushroom displays for both edible and inedible varieties should be impressive," said winemaker Stephan Bedford. He says that in addition to the different mushroom recipes to be ogled and eaten, other interesting and purposeful mushroom-related industries will represent such as medicinal varietals, extracts, and even a mushroom spray. By spraying the soil, he says, it works as a sort of inoculation helping bees to build immunity toward the various fungi that can and do typically infect and kill bee colonies. "It's incredibly fascinating," Bedford added. 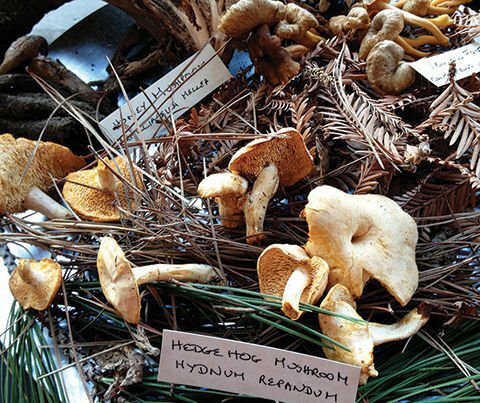 Also, noted mushroom expert Bob Cummings will be on hand for those interested in expanding their fungus knowledge, along with Bedford’s extensive collection of mushroom-related books and field guides to peruse. Vendor Branden’s Gourmet Mushrooms will be offering local mushrooms for purchase, and The Truffle Lady will be back with beautifully packaged truffle items, according to the event itinerary. In the world of taste buds, Bedford Wines will be poured and paired with dazzling mushroom fare on that Saturday afternoon. Small plates from recipes gathered from around the world will present themselves to attendees, ranging from simply grilled buttons to complex layered patés and wood-fired flatbreads prepared by the Bedford Culinary Kitchen, and headed by Bedford himself. He acknowledges that he's not the only one paying homage to the mushroom that weekend. "Everyone in town is doing a mushroom dish, from Charlie's to Bob's," Bedford noted. For example, Pico’s Restaurant will offer a three-course Mushroom Feast created by Chef Drew with matching wines on Friday, Jan. 25. Though the schedule is being flushed out entirely, event coordinators say that other Los Alamos restaurants will follow suit to honor the spore-bearing phylum in their own creative way. Bedford, however, doesn't take blame for the annual sporous event that continues to attract people from near and far, rather he credits his staff. "We have a great team of people that come up with these fun events that come from their personal interests. We really try to foster creativity," he said. Bedford Winery Tasting Room is located at 448 Bell Street in downtown Los Alamos. The event is $50 per person; $40 for wine club members. Limited spots are available. For reservations contact the tasting room at 805-344-2107 or tastingroom@bedfordwinery.com or visit www.bedfordwinery.com. To access the weekend itinerary and list of participating Los Alamos "Mushroom Festival" dining establishments, visit www.lovelosalamos.com. Reservation should be made through the restaurants. Amanita muscaria, the most easily recognized "toadstool" that is frequently depicted in fairy tales and in greeting cards, is also associated with gnomes.